Iberotel Miramar Al Aqah Beach Resort, in association with the Emirates Culinary Guild and the World Association of Chefs, is delighted to announce that they will be hosting the 3rd Annual East Coast Culinary & Cocktail Competition, which will take place on June 11th 2014. “The first year of the competition focussed on putting the UAE’s East Coast region on the culinary map, while last year the approach was expanded to include established UAE chefs as well as upcoming young culinary talent from across the UAE. This year, in addition to five hundred UAE participants, the competition will include few international teams, making it the first time that the competition will welcome global participants.” Expressed by the vice president of ECG for East Coast and the Executive Chef of Miramar Al Aqah who was the organizer and founder of the event. The Iberotel Miramar Al Aqah management and food and beverage team are hard at work with preparations for the glittering culinary event. Organizers have said that they expect to receive over two thousand visitors to the competition, many of whom will be hoping to catch a glimpse of one of their favourite celebrity chefs in action. The competition will attract over one hundred senior chefs from the region and abroad, as well as over fifty premium suppliers who will be showcasing UAE produce and products with food & beverage tasting to the public.
" This event showcases everything that’s GREAT about food; dishes produced will be some of the UAE”s most iconic cuisines. “ We want to see more inspirited people from around the region, from the grandest chef to the everyday cook. With your support we hope to expand this event offering year after year; attracting more visitors to the June, 11th1 day event, and develop further opportunities to support UAE’s culinary offerings 365 days per year." Commened Ashraf Helmy - General Manager & Area Business Development Manager Iberotel Miramar Al Aqah Beach Resort. This year’s competition will be the biggest yet, and the battle for top honours will be tougher than ever before. 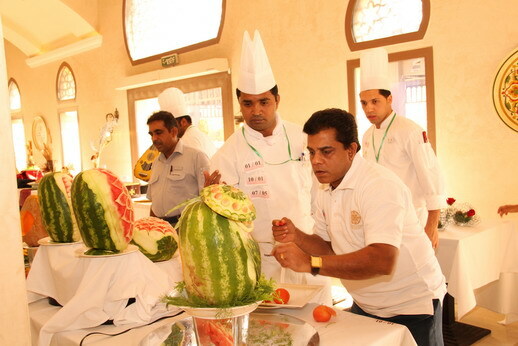 The 2014 competition comprises a total of fourteen categories (more categories than in any previous year), including Static Displays, Live Cooking, Pastry, Artistic, Bar & Cocktail. The celebrated culinary event will be held at the renowned Iberotel Miramar Al Aqah Beach Resort offering guests not only the opportunity to enjoy the culinary artistry on display, but also the chance to soak up the atmosphere at one of the region’s most distinguished beach resorts.